Christmas Card for my grandsons!!! Thread: Christmas Card for my grandsons!!! 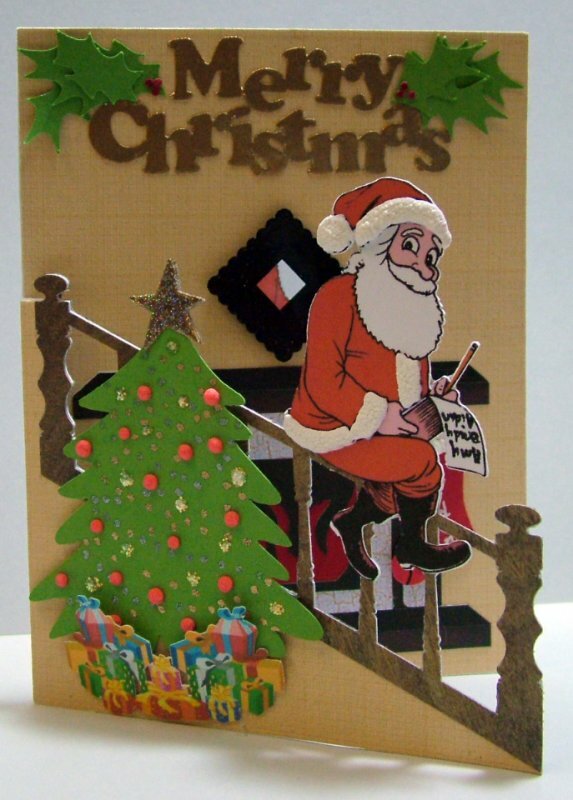 OK ya'll....this is my most very special card of the season, because it is for my two darling grandsons, Aidan (5) and Brady (3) and I so VERY much want to thank etui22 (UK Scrappers) for the simply marvelous template for the stair case, as this is what inspired by creation of this card. "rascal82" for the Christmas Tree, Star, Holly & Berries and "Merry Cristmas" title templates...thank you Lousie! Linda Hemmett for the "Christmas Pressies" template...thank you Linda! "JennieBean" for the fantastic "Fireplace" template...thank you Jennie! Hemera Big Box of Art for the wonderful "Santa"! The mirror and stockings were made by me. I think this has been the most fun card to make. I used Marvy/Uchida Liquid Applique for the tops of the stockings as well as for the trim on Santa's hat and costume! Once again Lin...........thank you so much for your marvelous "stair" template....like I said, that started it all!!! Most of the card was made using my CraftRobo...I love my "Roberta"! "The bad news is time flies....the good news is you're the pilot!" A lot of work went into that card. It is such a cute card for your darling DGS. I love the card. Oh that is absolutely precious and such a keepsake. You are very talented lady and thanks for showing your wonderful creation. What a amazing card. That is wonderful, what talent. Love this card! It is so cute! Your little guys will love this when they see it. Was the fireplace made by JennieBean or MrJennie Bean? I thought MrJennieBean made the fireplace. You did a great job with all the templates. 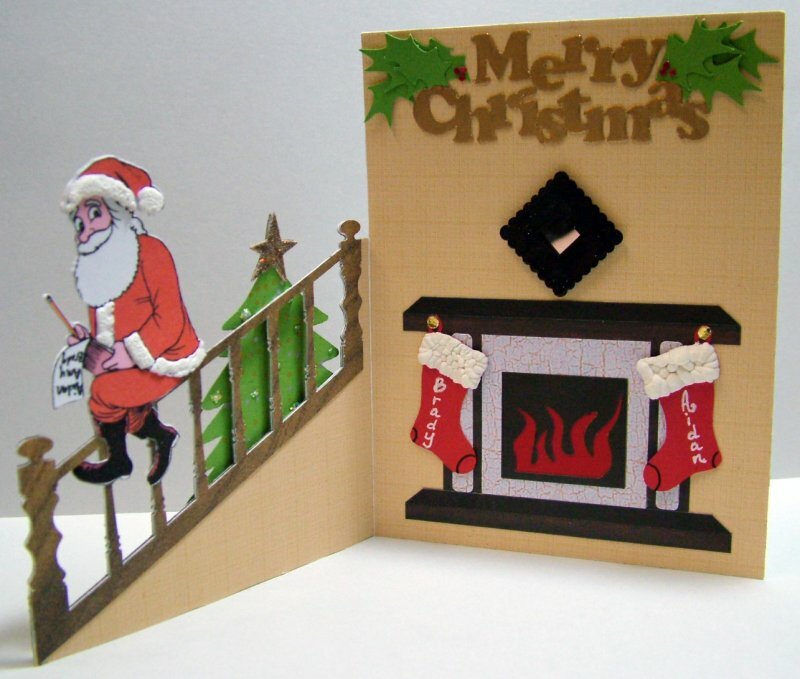 I haven't had a chance to use the stairs template yet and all my Christmas cards are done . Hmmmm, maybe I can start on next years ! Thanks, Barb. No, I just double-checked, the fireplace was done by Mrs. JB. I'll bet you could think of a way to use the "stairs" template for a Valentine card or even a St. Patty's Day card! Such a wonderful card. Very awesome. Thanks for sharing this with us.